Dolores Huerta will be the Keynote Speaker, National Hispanic Heritage Month, at the Northern Kentucky University (NKU), speaking about "Now is the Time! Activism for Social Change". 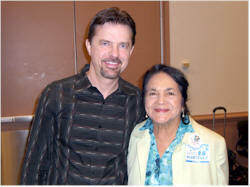 Dolores is the President of the Dolores Huerta Foundation . She co-founded in 1962 with Cesar Chavez and is First Vice President Emeritus of the United Farm Workers of America, AFL-CIO (UFW). In September of 2003 Dolores was appointed to the Board of Regents for the University of California system. She also serves on the boards of the Feminist Majority and People for the American Way. We would like to congratulate "Plaza del Sol " and its owner, Simon Cipriano, at the 4th Anniversary of its existence. It is always difficult to be a successful small business, and most of the small businesses fail within the first year. So being able to celebrate its 4th Anniversary is something to be proud of! HSF scholarship application period is now open! The Hispanic Scholarship Fund scholarship application period is now open for college students and high school seniors. Please forward this information to all potential Hispanic students in your respective location. They must apply by going to www.hsf.net and completing the appropriate forms. See dateline for completing application on the website. • Scholarships are non-transferable and can be used by recipient only. Frank Venegas Jr., Chairman and CEO of Ideal Group Inc., will be the Keynote Speaker at the Ohio Hispanic Chambers of Commerce Gala Dinner on Sept. 12th . Headquartered in the Southwest Detroit barrio known as Mexicantown, and employing 250 people, The Ideal Group companies’ combined 2007 annual revenues exceeded $151 million. In 2004, Inc. Magazine selected Venegas as one its of 25 America’s Most Fascinating Entrepreneurs and USHCC named Venegas as its 2004 Business Man of the Year. General Motors has awarded The Ideal Group its prestigious performance award, the GM Global Supplier of the Year (2002-2007) for Best in Class Construction Services and Material Management. Venegas serves on the Board of Directors for the Michigan Hispanic Chamber of Commerce and The Michigan Minority Business Development Council. He is also a member of the General Motors Global Council and is the current Co-Chair for the GM Supplier Diversity Council. He serves on the Tuck School of Business (Dartmouth University) Advisory Board and the University of Michigan – Dearborn Dean’s Advisory Council. Also know as the "Su Casa Festival", the Cincinnati Hispanic Fest is the largest Hispanic/Latino Festival is the South West Ohio. Liberty Tax Service is now offering a Tax Course designed to teach the fundamentals of income tax preparation. Full scholarships are available for bilingual students at our Norwood office. We will be offering full-time and part-time employment opportunities to students who complete the Tax Course and will welcome them to join our Liberty Tax Family. “Una familia sin fronteras”. Day, and evening, classes are available for your convenience, staring the week of September 8th. On August 7, 2008, Accenture teamed with the Cincinnati chapter of the National Society for Hispanic MBAs (NSHMBA) to host a panel discussion focused on “Developing a High Performance Mindset." Six Hispanic executives participated on the panel, including Accenture’s Jay Zerbe, Utility Industry Managing Director. Jay shared his thoughts about building and maintaining relationships. Another panelist, Tillie Hidalgo Lima, talked about goal setting. Tillie is the President/CEO of Best Upon Request, a company that Accenture played a key role in helping to “put on the map.” Best Upon Request is a privately held minority-owned and woman-owned national concierge services firm headquartered in Cincinnati, Ohio. Nellie Borrero, director – Global Inclusion & Diversity at Accenture, recently took some time to interview Tillie. Tillie offered advice for professional women and spoke about how networking, goal setting and stepping out of one’s comfort zone can be critical to one’s success. Read more... | 7149 bytes more | Comments? Mr. Juventino Cano, Board Member of the United States Hispanic Chamber of Commerce, visited Cincinnati on Wednesday, August 20th, and met with the Board of the Hispanic Chamber Cincinnati USA. It was only a second such a visit in Cincinnati by a Board Member of the United States Hispanic Chamber of Commerce. Door opens at 9 PM. Wynton Marsalis has been described as the most outstanding jazz musician and trumpeter of his generation, as one of the world's top classical trumpeters, as a big band leader in the tradition of Duke Ellington, a brilliant composer, a devoted advocate for the Arts and a tireless and inspiring educator. He carries these distinctions well. His life is a portrait of discipline, dedication, sacrifice, and creative accomplishment. To date Wynton has produced over 60 records and has sold over 7 million records worldwide including 3 Gold Records. With his collection of standards he reinvigorated the jazz musician's relationship to the American popular song. HOTTEST Wednesday nights with hottest Salsa dancers in town - the "Havana Nights". In the most classy Salsa location in town, according to Cincinnati Enquirer!!! Havana Martini Club is located on 5th St., between Race St. and Vine St. The Ohio Hispanic Chambers of Commerce celebrates on Friday, Sept. 12th, its 11th Annual Awards Gala. The event will take place in Columbus, OH, at the Renaissance Hotel. The prime objective of the Ohio Hispanic Chambers of Commerce (OHCC) is to promote the development and continued growth of the Hispanic business community in Ohio. The OHCC is committed to providing information and assistance to its membership by serving as a referral and resource center. The OHCC monitors local, state, and national programs and legislation to evaluate the impact on Hispanic owned businesses. As every year, outstanding Hispanic business people and leaders will be recognized by the Ohio Hispanic Chambers of Commerce at its Annual Award Gala Dinner. Last year, the 2007 Gala Dinner was a very special event since the organization celebrated its 10 Year Anniversary of existence. To honor this occasion, Ohio Governor Ted Strickland was personally there to congratulate the Award Winners. Also present were Michael Mentel, President of Columbus City Counci and Tracy Heard, Ohio State Representative. On, Saturday, September 20th is the Air Force marathon. SHPE OHIO-Southwest (OHIO-SW) Chapter is going to host a water station for the 4th Year. We need more volunteers! Time needed from 6AM – 3:30PM. The 2008 Cincinnati Dancesport Street Salsa Competition took place on Friday, August 15. Congratulations to Lisa and Jesus who took the first place, Greg and Kim (2nd place), and Luma & Ismail (3rd place).